I am an old fuddy-duddy. I really am, in many regards. For example, I have never played a MOBA-style video game. I know that several exist (LoL and DOTA, mostly) and that they are generally well-received, as many people in the office here have talked about playing them. But I, myself, haven't done so. However, I have played MOBA-inspired board games. Those can be pretty fun. 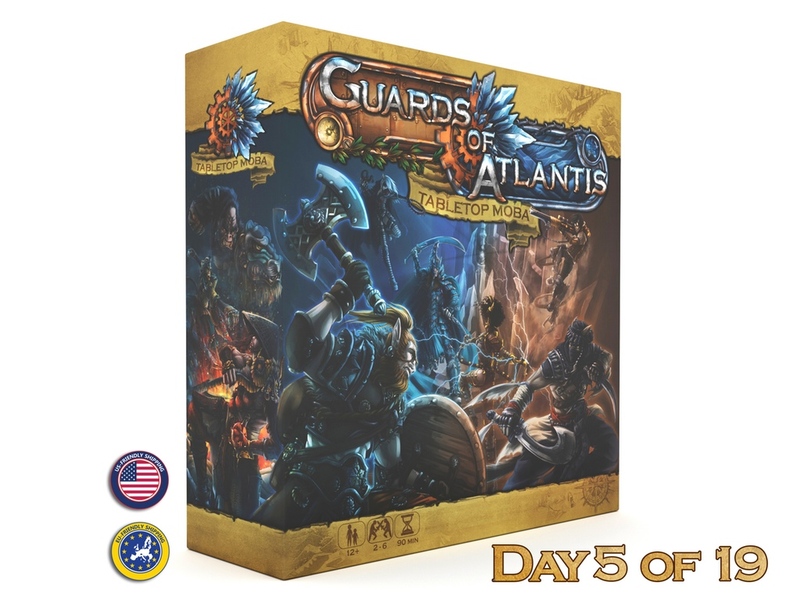 Another game looking to capture the style of the video game on the table top is Guards of Atlantis. They're up on Kickstarter now, looking for some funding love. As you would expect, in the game, you play as a team of heroes looking to attack your opponent. An interesting bit about the game-play is that your hand of cards (you get 5) is how you activate and attack with your models, but it's also your life for your figures. As, such, it's a "press your luck" sort of turn structure. Sure, you could move another figure by playing a card, but you're pretty sure your opponent is going to attack you and you'll have to discard something, and if you can't discard, that's really bad. The campaign's about 4/7 funded with still 14 days left to go.